Makeup and Beauty !!! It is a review of Khadi Herbal Shampoo in honey & almond. Celebrating Feminity : A tutorial on how to line the eyes, Tanmayee makes an attempt to make it easy to do for even beginners. Purple Moments : Reviewed Colorbar soft touch lipstick – of Matina. 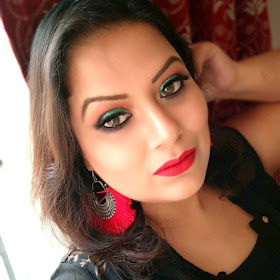 Apoorva Writes : For the first time ever Apoorva tried her hand on eye makeup. Cute nails :Puja got her new cheeky plates…see the post here. Girls corner : Tips for spa at home. Make Up Fashion & Everything I Like : Mila Kunis Inspired for Smokey Eye Tutorial! @lavanya thanks ! and i will visit yours for sure !